In this article we'll go over how you can modify your domain's DNS records, in order to split up your various services between multiple hosting providers. In most cases the average website owner will have all of their web services with one hosting provider. In some cases though you might want to split up your services, so that you have one provider actually host your website, and a completely separate provider to host your email. In order to follow any of the steps below, you'll need to have your domain name pointed at our name servers, so that any DNS changes you make in cPanel on our server is what your domain actually uses. A common example of this is if you're using a website hosting company that has a proprietary website builder but doesn't host email. So if you looked for a new web host and found InMotion Hosting, your plan might be to slowly transition your website over to non-proprietary website software with us, and in the meantime also have us host your email. In the steps below, we'll walk through using an example domain PrimaryDomain.com. Where we would like to continue to have the e-mail hosted by InMotion Hosting, but we want to point our DNS A (Address) record to another website host where you might already have your site built. Locate the domain you'd like to modify in the list and click on the Manage option. In this example, the DNS records are already set up pointing to InMotion's servers for all of the services. The only thing we need to modify is our A (Address) record of the website. Click on Edit beside the primarydomain.com entry. Fill in the IP address of your remote website host in the Record field, then click on Save Record. Anytime you make DNS changes, it can take between 24-48 hours for those DNS settings to fully propagate across the web. Your website will not start immediately pulling from this new IP address, and it will take a different amount of time depending on several factors. You should now see the new A record you updated. Now click on Edit beside the CNAME record for mail.primarydomain.com. Change the Type from CNAME to A and enter the InMotion server's IP address in the Record field. You can always find your IP address in cPanel. Once done, click Save Record. Next, locate the MX record for the domain and click on the Edit link. Now, edit the record change the Record field by changing it from primarydomain.com to mail.primarydomain.com. Click Save Record to save the changes. A common example of this, is if you'd like to host your website with InMotion Hosting, but you have email services with another provider such as Google Apps for your domain. In the steps below, we'll walk through using an example domain PrimaryDomain.com. Where we would like to continue to have the website hosted by InMotion Hosting, but we want to point our DNS MX (Mail Exchange) record to another email host. 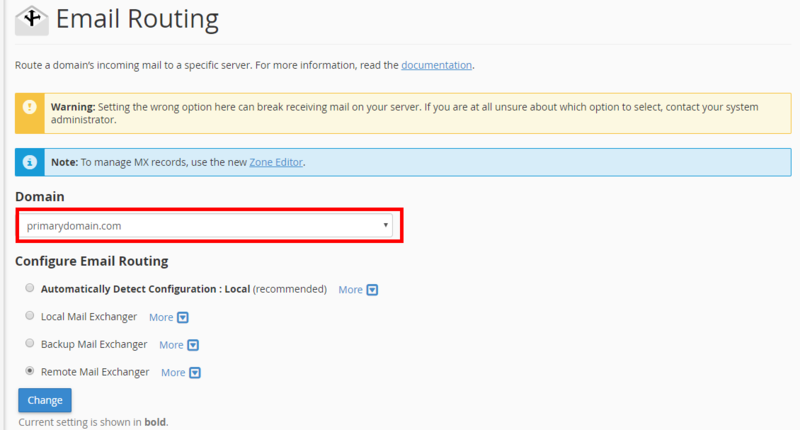 Under the Domains section, click on Zone Editor. Next, locate the MX record for the domain and click on the Delete link. A confirmation popup will appear. Click Continue. At the top of the screen, click on Add Record and then click the Add MX Record option. Once saved, the MX Records will appear in the records list. Return to your main cPanel screen, locate the Email category, and click on the Email Routing icon. Select your domain from the dropdown list. Click on the Remote Mail Exchanger option. Anytime you make DNS changes, it can take between 24-48 hours for those DNS settings to fully propagate. So your email will not start immediately delivering to these new remote MX servers. You should now understand how to split up your domain's various services by using DNS records. While this typically isn't needed for the average user, it might be good to know that you do have this option available to you. I want to use an encrypted 3rd party email provider such as StartMail. Does InMotion servers work with 3rd party email providers(like SmartMail) that help the consumer protect themselves from unwanted intrusion? Or are the consumers subject to only having their email on google servers? InMotion Hosting provides DNS services which you can use to direct your email to any service you prefer. Google is used in the example above, but you can use any email service that works best for your needs. i recently decided to let inmotion host my wordpress site while using godaddy's workspace email to handle my emails. btw domain is hosted at godaddy. from my godaddy control panel i changed my nameservers to ns1.inmotionhosting.com and ns2.inmotionhosting.com. then i went inside inmotionhostings cpanel->MX Entry and created 2 MX records to point to the nameservers responsible for godaddy's workspace email. email works and goes into my godaddy workspace email inbox. i realised that, contrary to what i read on these forums, I didn't have to create an A record called 'mail' and point it to godaddy, then create 2 MX records and point them to 'mail'. now why is this so? MX records must point to an A record. The mail record we suggest creating is an A record. The server names you are pointing to at GoDaddy are also A records. That is what matters. What did you use to create 2 MX records to point to the nameservers responsible for godaddy's workspace email? I am not sure what to use? If you are pointed to our name servers, then the MX Entry tool in the Email category of the cPanel has the interface to create MX records. I also have inmotion host my wordpress site while using godaddy's workspace email to handle my emails and domain is also hosted at godaddy. You said "from my godaddy control panel i changed my nameservers to ns1.inmotionhosting.com and ns2.inmotionhosting.com. then i went inside inmotionhostings cpanel->MX Entry and created 2 MX records to point to the nameservers responsible for godaddy's workspace email." May I please request you what specific MX records have you created? Then, point the 'a record' for mail.example.com to your IP address at GoDaddy. The main difference we're talking about is how the DNS is being handled and specifically where it's being handled. MX records are part of the DNS. So, when something is emailed, the responding server first has to identify WHERE it's coming from. The DNS records (on the DNS server) provide this information. However, this information is shared in DNS servers on the Internet in general, so if the servers went down (heaven forbid), then the main thing that would be affected is that no DNS changes would occur until the servers (specifically the InMotion DNS servers) came back up. An example of a DNS change is like changing the MX records you're referring to. Once a change is made, it is propagated on the internet. In regards to your MX records, email would still flow if you're already pointed to Google Apps - unless Google's servers went down - which probably won't happen. Bottomline, if you want your email to be handled by a third party such as Google Apps, then email would still work if an outage occurred at the InMotion servers. I am in a similar situation. How did you end up solving the issue please? I will love to hear from you. Thank you for contacting us. If you want email hosted at 2 different places, you would have to setup 2 separate mail servers, and point their "A record" to different locations. mail1.example.com with an A record pointed to Google Apps. mail2.example.com with an A record pointed to InMotion Hosting. Then, people using Google apps use mail1.example.com as their mail server. using the free offered test domain alias from Google. So far everything working fine but groups! Google Apps > Get emails of course. InMotion Hosting > Don't get emails! Other public services (Hotmail, outlook.com, yahoo,..) > Get emails. So far things work, but now mail from Gapps/Inmotion to Group don't reach Inmotion-hosted accounts inside that group. Ex: When I send email to a group contain users from Gapps, Inmotion, hotmail, etc.. the message don't rach Inmotion accounts only!! Are the emails returned or bounced? If so, can you provide the returned/bounced message? Also, it may be easier to contact live support at the time you are sending the emails. so they review the server logs in real-time. No, there's no return emails. It went fine as it's delivered to end user without any sign of delivery failer. I am configuring spilt delivery with Google and it was working fine. When I delete the CNAME record and create the A recod my hosted email with inmotionhosting no longer able to receive emails. Any suggestions please? This is because the MX records which control mail point to the location of your A record by default which is then sending your mail to the other location that you changed your A record to. 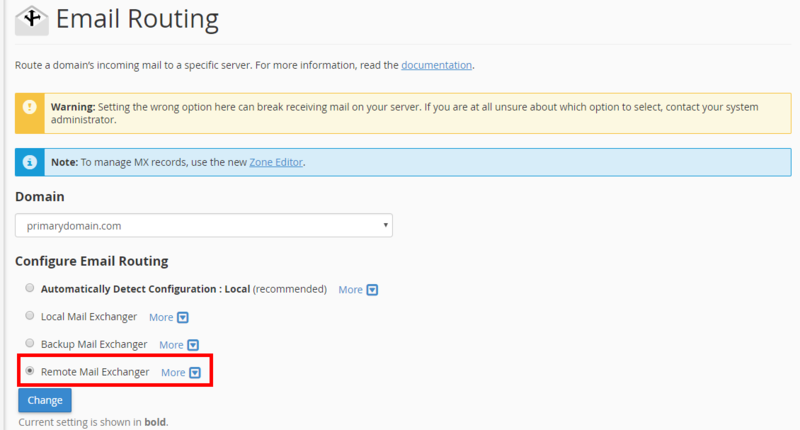 To fix it, you may use the MX Entry tool to point your mail to the server that you are located on. You may see this to the left side of cPanel and will say something like bizXXX.inmotionhosting.com.